The biggest NAMA story of the week was the revelation in the High Court that Mary McCabe, wife of high profile NAMA developer John McCabe, owned an 8-carat diamond ring and that NAMA had successfully sought the appointment of receivers to it. The story attracted a spectrum of reaction from outrage at the humiliation of a woman in open court to outrage at the notion that an asset worth at least €140,000 should not be used to help pay down a €20m personal judgment against Mary McCabe in favour of NAMA and ultimately the taxpayer. But apart from the rights and wrongs and ethics, another angle is emerging in the story. Last June 2012, we learned that NAMA was considering referring one developer to the Gardai for making a false declaration of assets. This was before NAMA went to the High Court and secured nearly €300m in total judgments against various members of the McCabe family, including a €20m judgment against Mary McCabe. There is no evidence of any connection between the McCabe family and the NAMA Garda investigation. So, have we heard the end of the yarn about the 8-carat ring, a yarn which bears the hallmarks of a Georgian melodrama about a lost or stolen five shilling note? Who knows, but what we do know is that it is a criminal offence to knowingly make a false statement to NAMA and although we don’t know the circumstances in Mary McCabe’s own case with her jewelry, we do have reports of there being two statements from Mary McCabe, and of NAMA being alerted to the existence of the jewelry from a family email. The fascinating struggle between wealthy developer and businessman, Paddy McKillen on one hand and the billionaire Barclay brothers on the other, over control of three London hotels continues this week in the British Court of Appeal, located in the Royal Courts of Justice on the Strand in London. The case is set to commence Tuesday 5th February, 2013 (not Monday as previously reported) and is scheduled to last four days. 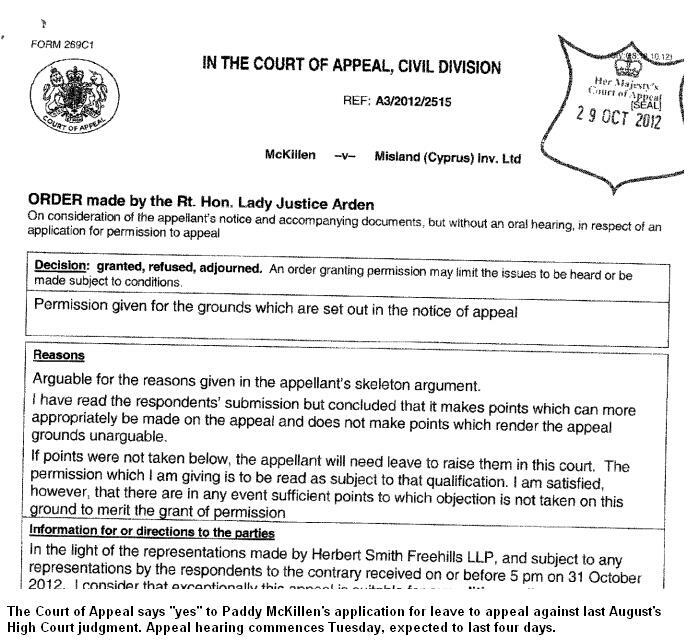 The decision to allow the appeal – extract reproduced above – was announced last October 2012. Outside the courts, it seems as if Paddy and the Barclays, Sir Frederick and Sir David – owners of the Telegraph newspaper, the Ritz Hotel in London and other businesses – has been fought to a stalemate. Somehow the Barclays managed to buy 28% of the company which owns the three hotels – Claridge’s, the Connaught and the Berkeley – and the Barclays also appear to be in a position to influence the 36% owned by down-on-his-luck Derek Quinlan. But the scrappy Paddy remains with his 36% and surprised not a small number of people when he managed to raise the finance in December 2012 to meet a capital call initiated by the Barclays, and in so doing, has retained his 36% stake. So the Maybourne board presently comprises the Barclays’ interests, nominally Derek Quinlan’s and Paddy’s. The Barclays are on record for having a position of being happy to tolerate a stone-in-the-shoe minority shareholder as long as the minority shareholder had less than 10% of the company. Paddy’s raising of the estimated GBP 55m at the end of last year, has, for the time being, put paid to that aim on the Barclays’ part. In the appeal on Tuesday, Paddy is throwing everything at having the control by the Barclays over Derek Quinlan’s stake challenged. Paddy was comprehensively beaten in the High Court last year on this issue in what can be described as a curious decision. People joke about how rich Bill Gates is, and if he fell out of a bed made of US $1 notes comprising his fortune, would he ever hit the ground if height was constantly added to reflect interest on his US $30bn fortune. That’s rich, but personally I would prefer to be so rich that I could donate/loan GBP 4m to someone whose name I couldn’t spell as in the case of the Barclays who referred to Derek Quinlan as “Derrick”. However the judge accepted the Barclay brothers’ version of merely helping out a friend in need. Paddy asserted that the money loaned/donated by the Barclays to Derek Quinlan was to practically acquire control over Derek’s stake, something that should have triggered a shareholder pre-emption agreement whereby the disposal of shares by existing shareholders must involve an offer of first refusal to other shareholders. It is worth pointing out that the judge in the High Court was absolutely mistaken in one of his conclusions. Judge David Richards concluded that Paddy would not be able to raise the funds to buy Derek Quinlan’s 36% stake in the group, but as we saw in December 2012, not only did Paddy actually raise the GBP 55m to take up his requested contribution to the rights issue but he stood ready to acquire Derek Quinlan’s also if Derek was unable to find the readies. As it happened, Derek did in fact magick up the readies, but Judge Richards’ judgment of Paddy looks wrong, and it looked wrong last August when it referred to the Barclays in the matey “Sir David” and “Sir Frederick” terms. Paddy faces an uncertain future should he lose the appeal. Last September 2012, costs estimated at €25m were awarded against Paddy in the failed High Court battle, and although Paddy has already made a contribution to these, additional costs will be racked up this coming week, and if Paddy again loses, then he will be expected to cough up the outstanding costs. The source of the GBP 55m funding used to take up Paddy’s share of the rights issue in December remains unclear but if it was a loan, then the lenders will be looking for an exit, and if Paddy simply remains with 36% of the group if he loses the appeal, then how will those lenders be repaid, and what interest are they levying? By normal standards, Paddy is a wealthy man, but the most recent estimate of wealth I have seen is the 2009 Sunday Times Rich List that puts his net wealth at GBP 66m. We were all kicked out of the court room last year when his current wealth and assets were being discussed, so all we have are the reflected comments of Judge Richards in the High Court judgment which didn’t paint a glowing picture of super-wealth. On the other hand, if Paddy does win the appeal and is placed in pole position to acquire Derek Quinlan’s stake, then with a prospective 72% of the Maybourne group and the legacy legal bills erased, Paddy will be in clover. The case will be covered in detail on here.